BackyardRink.net is where you will always have the home ice advantage, thanks to our extensive research and documentation. 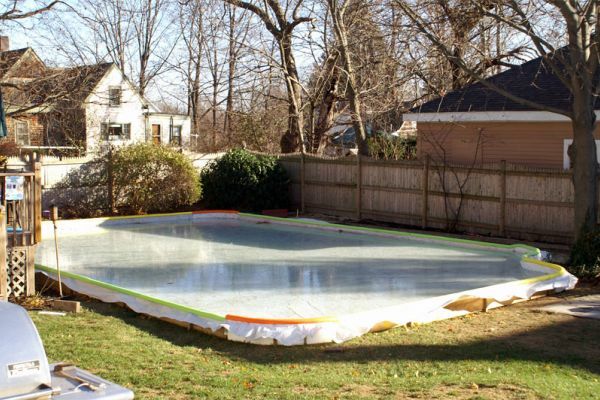 We hope you find everything you need to make your backyard rink the most successful it can be each season. Have you ever wanted to play hockey or just do some skating, but didn't feel like packing up all the gear to go to the local rink or that pond out in the woods where you have to be part mountain lion to get to? Well I use to have that problem, but not any more. I decided to put a rink in my backyard. After a season of having my very own backyard rink I found a Yahoo Group dedicated to just such a thing. I decided to build this site to keep track of my journey and see if I can inspire others and help them on their journey as well. BackyardRink.net is dedicated to all those crazy fanatics out there that go through the time and effort to build a rink in their backyards every year. This site will highlight some of the trials and tribulations, tips and tricks and share some pictures of my rink and rinks that others have done. This site is intended to be a resource for those just starting and a place to get new ideas for those already seasoned vetrans. As one of those crazy fanatics I can say it is a labor of love that we do this. My wife thinks I am 100% off my rocker, especially when I go out to resurface the rink @ 11:30 pm, but the kids love it. Winter 2013 - 2014 will be season 9! I wonder what this season will bring? Asking "How to build a rink" is kinda like asking "how to make meatloaf." Everyone has their own recipe and they all work. It is a matter of what works for you. If you have an unlimited budget and are not as handy you can buy all the stuff you need from places like NiceRink. If you live somewhere REAL cold all you have to do is flood your yard and watch it freeze. This article is for those in the middle of the two extremes, those that are handy enough to do it themselves, but know when a good quality product is a good idea as well. Season 10 is off to a..., well not so great start. The frame went up the way it always does and then the waiting began. Looking at the temps I decided to drop in the liner and hope the forecasts were right. After about an hour of filling, with two hoses, I noticed water outside of the frame, NOT GOOD! After a close inspection it appears that the liner has razor cuts along one of the folds. Out comes the submersible pump and three 45-50 gallon barrels. I took enough water out to inspect the entire length of the fold and low and behold it is all the way down the fold. I know I have stated that I started out by using 2x2 stakes to hold my frame and they worked "fine" for the first couple years. I then moved to 1/2" rebar and again they served me well. Now "well" is a relative term here. By that I mean that I never had a blowout because they didn't hold up to the pressure of holding back a little under 6,000 gallons of water. I did however have the frame lean from the pressure. Sooner or later someone is going to try and walk out onto your rink when they really shouldn't have. The result will be a mess that may seem impossible to recover from. Someone did that to me and I got lucky and things warmed up before the rink froze again and things worked themselves out. If you are not so lucky, here is what you can do to speed up the repair.